Delancey Street Associates (DSA) announced the latest round of vendors joining the Market Line, a marketplace spanning three city blocks along Broome Street as part of the Essex Crossing project on the Lower East Side. S.E.A. Market is the first retail location from Kevin and Ina Liang, offering imported goods from South-East Asia. Gouie New York (pronounced: GOOEY), from duo Yudai Kanayama and Keisuke Kasagi will explore Japanese pintxos and offer one of the widest varieties of sake on tap in New York, including their own exclusive line for The Market Line. Opening early next year, The Market Line will gather a diverse mix of more than 100 locally sourced food, art, music and fashion retailers that embody the character and culture of the LES. Whether a local or a visitor, this new venture will represent the long-standing traditions and character of the storied community. It will complement the new home for the 77-year-old Essex Street Market, whose current vendors will move into an adjacent state-of-the-art space later this year. Upon completion, the 150,000 s/f Market Line will not only be the largest market in New York City, it will be one of the largest in the world, putting this modern interpretation on par in size and scope with historic La Boqueria in Barcelona and Borough Market in London. 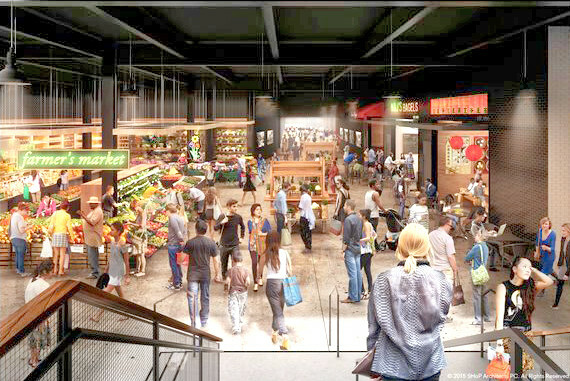 The first phase of the 700-foot-long Market Line will open later this year, as will the new Essex Street Market. Both will be housed in the first and cellar levels of 115 Delancey Street, a 25-story mixed-income residential building at Essex and Delancey streets. Together, the first phase of The Market Line and the new Essex Street Market will comprise over 100 vendors. The Market Line space was designed by SHoP architects and the base building designed by Handel Architects.